The IACP conference gets into high gear later today. Yesterday was my last vestige of unstructured time before the agenda gets packed. After a productive morning of work in the hotel room, I treated myself to a couple hours walking around the French Quarter. And after all that serious thinking and writing, I was famished. My chef pal Kevin Davis, owner of Steelhead Diner in Seattle (and a good Louisiana boy!!) had recommended Central Grocery for a casual lunch. 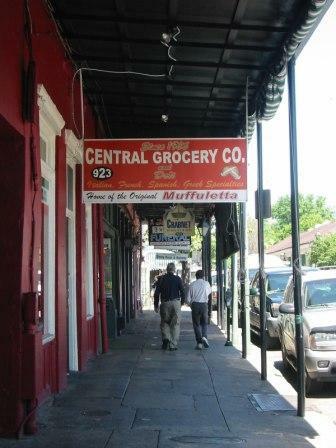 As you can hopefully see from the sign, hanging over their Decatur Street entrance (across from the French Market), they’re the home of the original muffuletta. This flavorful sandwich is something of a take on the grinder or hero: slices of salami, cheese (provolone, I imagine) and an olive “salad.” Definitely not to be confused with a tapenade, the green olives are chunky, accented with bell pepper, garlic, other goodies, and drippy with olive oil. The bread was distinctive, I should have asked what they called it or where they got it. The crust is softer than that of a baguette or ciabatta bread, with firmer crumb texture than a hamburger bun, it was just right to snugly enclose the fillings while also absorbing the olive-oil goodness of the olive mixture. My new favorite potato chips (and I am all about new adventures in the salty-crunchy realm!) are these Zapp’s below, flavored with tomato and heat of Tabasco sauce. Something like a Cajun barbecue potato chip, they’re really tasty. 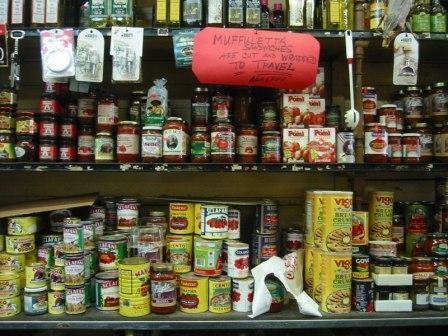 This shop is one of those amazing dusty, Italian groceries with shelves packed with every kind of tomato sauce, olive, condiment, biscotti, you name it. Plus some fresh pastas, cheeses, etc. 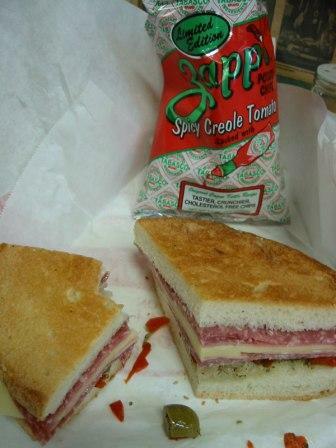 Really a mini-musum of Italian culture, with a signature sandwich to boot. One added plus about Central Grocery is that the original Cafe du Monde is across the street on the same block. So if there’s any chance the muffuletta sandwich didn’t do you in completely, you can pop over there for some after-lunch beignets and chicory coffee. 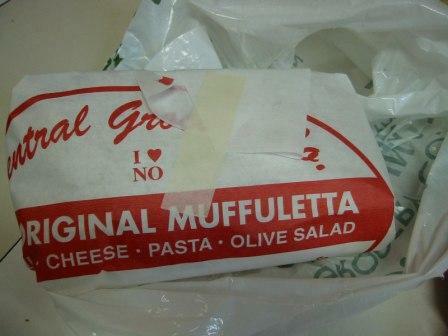 I didn’t (half of the “half” muffuletta was plenty for me). But a group of friends lunching next to me on the nondescript counters did just that. I was only a smidgen jealous. Last night’s dinner at Cochon was really wonderful. But gotta run. More when I next can break away from the conference. Which may be when I get back home…..
COME ON DOWN TO NEW ORLEANS!! The eating is mighty fine.